Show Book and Entry Form is now online. Don't forget to Also print the Egg Show Entry form! To download our 2017 show catalog and entry form, scroll down to the bottom of this page and click on the links under Attachments. happening on October 14 2017! Our show kicks off the 2017-2018 Cal-National show season. NOTE: The CCFF show will mainly happen on Saturday, October 14. Coop-in starts Friday evening, Oct. 13. and coop-out will be Saturday after the show. 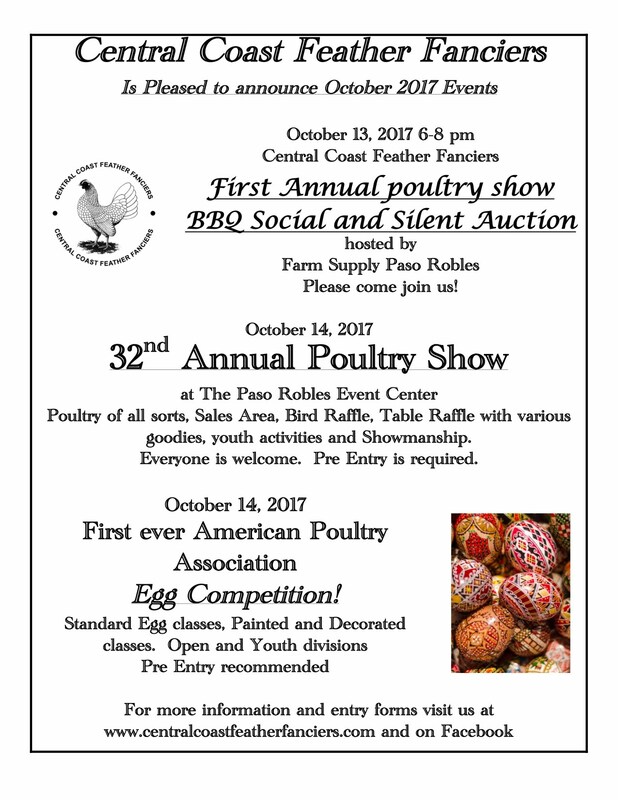 In addition to the show, quality poultry will be for sale - this would be a great time for 4-Hers to explore the breeds and see what's available. The Sales area will start filling on Friday night and Saturday morning as people arrive at the show. Arrive early for the best picks. There will be plenty of activities for juniors, including showmanship and the Avian Bowl of Knowledge. We will also have a breeders' raffle and item raffle. Plus - A Wonderful Silent Auction!